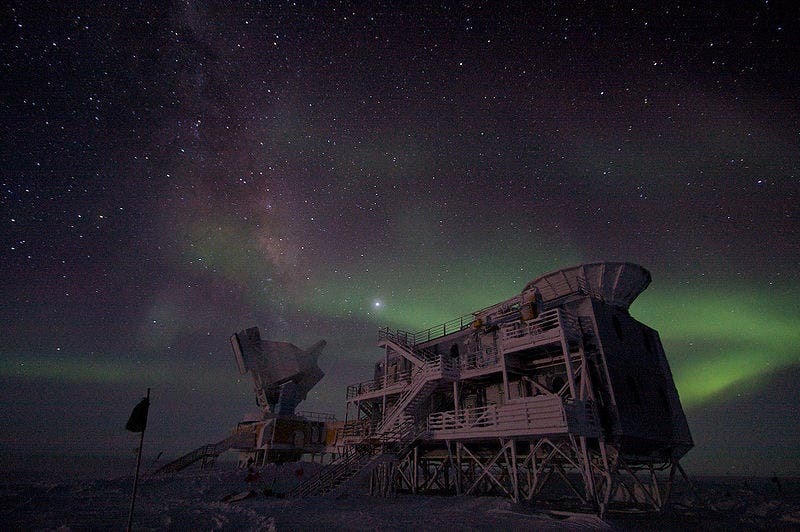 Since 2007 University of Chicago researchers have used the South Pole Telescope in their attempt to help solve the cosmological mystery of dark energy. Little is known about this force, other than that it works against gravity and appears to have sped up the expansion of the universe. Dark energy, says Michael Turner, director of the Kavli Institute for Cosmological Physics. is "the most profound mystery in all of science." Cracking the problem requires collaborations of original thinkers working beyond the limits of current theories. High on the institute's research agenda are the riddles of dark matter and cosmic inflation. Along with dark energy, these are the three pillars of modern cosmological theory, "and none of them can be explained with physics that we know," Turner says. "They're all pointing to new physics." The mystery of dark matter may be easier to solve. Kavli Institute scientists hope to accomplish this feat within the next decade. They suspect that dark matter is made of a new form of matter, something that does not consist of quarks, neutrons or protons. Dark matter may reveal itself through any or all of three means: direct detection via ground-based detectors at the Chicagoland Observatory for Underground Particle Physics (COUPP), indirect detection in the galaxy halo via satellites, and production of the particles at the Large Hadron Collider at CERN, the European particle physics laboratory. The South Pole Telescope uses a phenomenon called the Sunyaev-Zeldovich effect to pinpoint when dark energy became important in the history of the universe. The SPT measures the slight temperature difference associated with the SZ effect to produce an image of the gas in a galaxy cluster. The deep dark spot in the middle of the images is the SZ effect from a cluster of galaxies. The NSF created the Physics Frontiers Centers program to make significant advances at some of the most important intellectual frontiers in diverse physics subfields, says Joseph Dehmer, director of NSF's division of physics. Argonne is a new partner in the Uuniversity of Chicago PFC. Argonne and Kavli Institute scientists will develop large-scale cosmological simulations on the laboratory's supercomputers, as well as sensitive new detectors for the South Pole Telescope, which studies the cosmic microwave background radiation leftover from the birth of the universe. Kavli Institute scientists will investigate the dark energy question with the SPT and the Dark Energy Survey. The latter project, led by Fermilab, will collect data on approximately 300 million galaxies spanning two-thirds the history of the universe in order to measure dark energy with new precision. The image below from a computer simulation illustrates the formation of galaxy clusters and large-scale filaments in a model of the universe, which includes cold dark matter and dark energy. "Right now, there is confusion — claims of possible detections, counter-claims, and spirited debate — and the time is ripe to solve the dark matter problem. 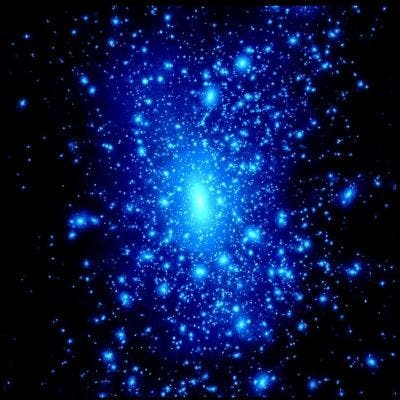 Our PFC hopes to shed critical light on dark matter," says Rocky Kolb, the University's Arthur Holly Compton Distinguished Service Professor in Astronomy & Astrophysics, who leads the PFC's dark matter effort. Cosmic inflation is a different kind of problem. It has emerged as the most important cosmological concept since the Big Bang theory, but many of its claims have not yet been thoroughly tested. Inflation proposes that the universe expanded extremely rapidly in a tiny fraction of a second after the Big Bang. Such a swift expansion would explain some important questions that Big Bang theory alone has been unable to answer. "We have some circumstantial evidence that inflation took place, but we'd like to make the case very strongly," says John Carlstrom, the S. Chandrasekhar Distinguished Service Professor in Astronomy & Astrophysics. A more direct indication of inflation would be to look for a minute sign of polarization in the cosmic microwave background, the afterglow of the Big Bang. For the last decade, center scientists including Carlstrom and the late Bruce Winstein have been developing a technology capable of measuring this polarization. Now they need to deploy that technology to see what they can find.